Sreelakshmi recalls an incident that occurred when she was four years old. With a child’s view of the world, she decides that since honeybees make and eat honey, they must be full of the delicious, viscous liquid. Off she goes—deciding that she would rather get the honey on her own. What results is her opening her mouth eagerly and clamping down on a bee—but, in the place of imagined sweetness, the disgusting taste of an insect’s innards fills her mouth. She later finds out that she had actually eaten a wasp. Lest the child runs off eating bees or wasps again, Sreelakshmi’s grandmother offers her the bottle of honey and tells her to take as much she wants. The girl shoves a spoonful into her mouth but all it does is to bring back the taste of the wasp. Sreelakshmi never eats honey again. Once she killed herself, Sreelakshmi should have been gone. But a deliberate act by her former lover ties her back to the mortal realm, and she finds herself weaving in and out of the lives of a few women, deftly drawing out their hidden secrets and stories, even as she herself lingers within an old almirah as a fragment—literally—of her former self. Through her, we learn of how Little Megha learnt a terrible lesson about how not all affection is to be trusted; of Najma’s acid-ravaged face—testimony to a life torn apart to shreds; of Brinda’s disappointment that success in spades was not what it seemed to be; and the dregs of Urvashi’s affair, which now seep into her life as cusses and threats over the phone…. There is also the underlying thread of Sreelakshmi’s own story—and we are constantly reminded, even as we delve into people’s lives, that she is waiting to share her own tale with us. Finally, the story unfolds—a tale of feelings not reciprocated, of society’s disapproval, and the eating away of one’s will, which ultimately leads to her taking her own life. It soon becomes clear that, like Sreelakshmi, the women learn their lesson about illusions the hard way—when bitterness floods their mouths and the memory of an unpleasant taste refuses to leave their tongues. Anita Nair, with her trademark combination of a strong narrative, and elegant but grounded language ensures that the reader is left with little choice but to turn the page. The stories lead from one to other, linked only by the movement of a relic that holds Sreelakshmi’s spirit (and voice) within. The stories draw the reader in deep—so deep that one sometimes has to pull away from the pages, take a breath and shake off the rising feelings of anger, disgust or sorrow. Given that each of us could as easily put a name from our own lives and circles to each one of the characters makes it even harder to view the stories as just fiction. One, of course, is also reminded of the time when what seemed to be a promise of sticky sweetness ended up leaving a bitter aftertaste—and robbed us of our naïve innocence in its wake. The stories point also subtly reinforce the fact that inflexible social norms, hypocritical double standards, and the biased unkindness of the outsider who peeps in from the fringes are but constants, no matter which day and age or country we may be living in. The ripple of a rumour along the neighbourhood, the sharing of a video on social media—the forms may have changed, yet much remains the same. Through it all, Nair gently reminds us that, no matter what, there is no halting in our tracks. In one way or the other, people pick up the pieces and move on. They may sever a relationship or cling to hope, throw off their veils and brave the world, or even walk away from it—whatever it is, they make a choice in the light of the bitter memories that dog them. And every choice requires courage. As much courage as it takes to eat a wasp. A writer and editor, Yamini Vasudevan has worked with some of the biggest names in the publishing world. 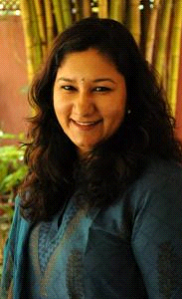 She is currently working as VP – Branding and Communications at SARAS Works. Prior to that, she was Managing Editor of Culturama – an Indian cultural magazine for expatriates living in India. Her previous work experiences include terms at The Hindu Business Line (Chennai), Harper’s Bazaar (Singapore) and The Singapore Women’s Weekly (Singapore). She was also co-author of the book Singapore Indian Entrepreneurs: Dreams to Reality (2004) which was published by the Singapore Indian Chamber of Commerce and Industry. Yamini’s writing spans political/historical narratives and analysis, qualitative business issues, travel and lifestyle – and her articles have been published by top newspapers and magazines. Fiction is a long-standing love, and she has published several short stories for children and adults. Her short story, ‘Beautiful’, was also the winner of the 2013 Indireads Short Story Competition in the Romance Category. She also has a romance novella due for publication. You can read more at her LinkedIn page or at her website.